Join us at our next Economic Development Insider Series! 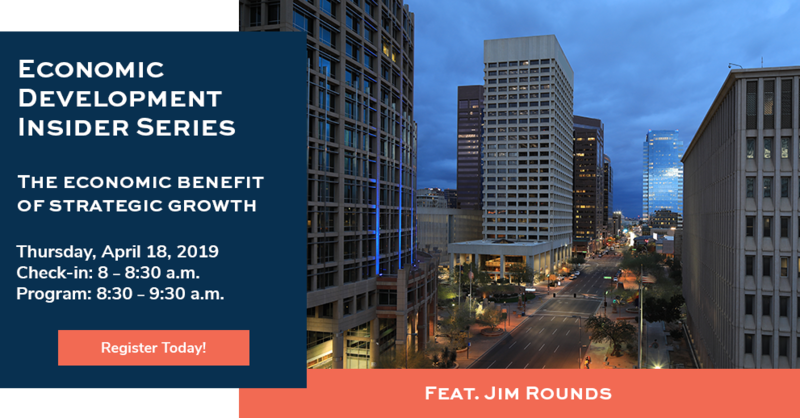 This bimonthly, hour-long program is the Greater Phoenix Chamber’s exclusive series featuring insider information about the hottest economic and workforce development trends in Greater Phoenix. On April 18, the Economic Development Insider Series will feature Jim Rounds, President of Rounds Consulting Group. Local economist and policy expert Rounds will share updates on the economic impact of legislative issues affecting business this year, and how strategic growth focused on high wage jobs will pave the way for our economic future. Don’t miss this opportunity to connect with local business leaders, and learn what you need to know about current trends to stay ahead of the curve. Check-in Time: 8 – 8:30 a.m. Program Time: 8:30 – 9:30 a.m.